Bridge Cottage stands on Uckfield High Street, just by the bridge across the River Uck, and today more or less opposite the Uckfield Waitrose. It has stood there since about 1436. The house has just completed a three year restoration by the Uckfield & District Preservation Society, re-opening in April. We have arranged a private tour for LHG members for the evening of Monday 22nd August – note that this will start at 7 p.m. You will discover how this medieval hall-house has changed over its 580 year history. The visit will include a talk by Michael Harker, leader of the restoration project, that will cover the history of the house, its owners and occupants, and the challenges of rescuing and conserving this15th century gem. There will be a £4 entry charge. The visit can accommodate a maximum number of 40 people. Email leweshistory@gmail.com by 15 August to reserve your place, with ‘Bridge Cottage’ as the email subject. There will be plenty of car parking available nearby on a Monday evening, and the 29 Brighton-Lewes-Uckfield-Tunbridge Wells bus passes the door. The current bus timetable offers a 29X that leaves Lewes Waitrose at 5.54 and arrives at Uckfield bus station (very close) at 6.12 and a 29B (via Ringmer) that leaves Lewes Waitrose at 6.26 and arrives at Uckfield at 6.54. Return 28 buses leave Uckfield at 8.48, 9.48 or 11.16 p.m, all travelling to Lewes via Ringmer. We do not advise trying to travel by train! Sussex Police report that a valuable historic artwork featuring of Shelleys, Lewes, in bygone times disappeared from the hotel reception area overnight on 23/24 June. If you happen to notice such an item offered for sale, they would like to hear from you. The map below was published as part of the 1868 Boundary Commission Report, which proposed extending the area of Lewes borough from the green line to the red line. The green line shows the borough boundary established by the 1832 Representation of the People (Reform) Act, which for the first time included the Cliffe and part of South Malling parish within the borough. Before 1832 the borough was much smaller and ended at the river Ouse. The effect of the 1868 recommendations was to include additional land to the north of the town within the borough. 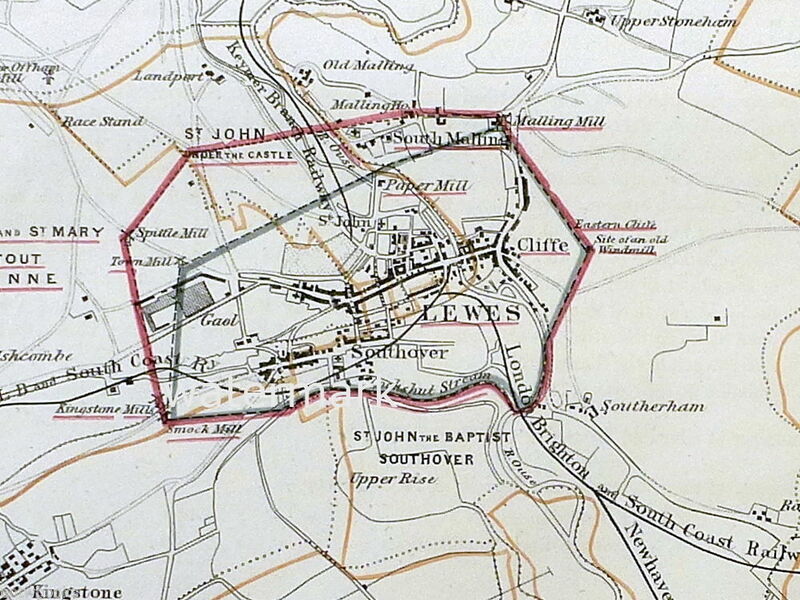 One major consequence was to include the whole of Lewes Prison, built in the 1850s straddling the 1832 borough boundary line. Church Lane in South Malling was also included within the borough, bringing with it South Malling church, the Deanery and Malling House. Both boundaries used the present and former windmills around the town as boundary markers, with the 1868 boundary using the Spittle Mill in place of the Town Mill, near the prison. The 1867 Representation of the People Act also reduced the representation of 35 English boroughs, including Lewes and Chichester, from two MPs to one. It also doubled the national electorate from one million adult males to two million. Arundel lost both its MPs in 1868. 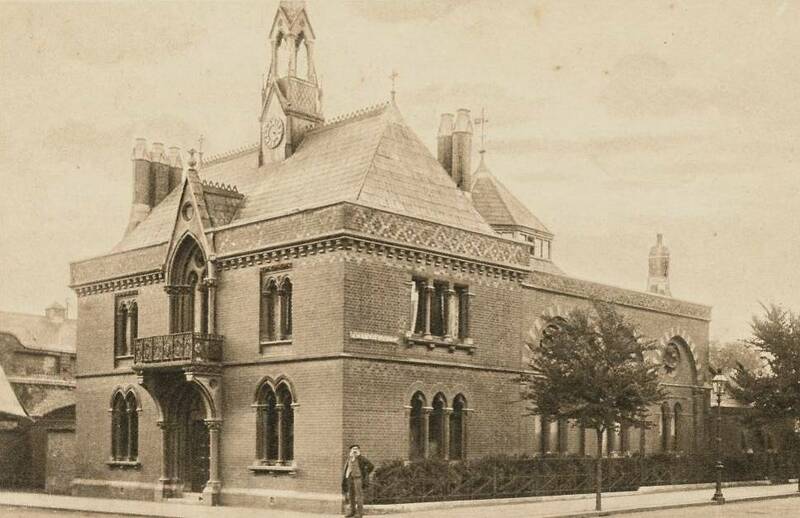 This remarkable Gothic building, designed by Sir George Gilbert Scott, was built in 1862 as a memorial to Henry Fitzroy (1807-1859), Conservative MP for Lewes 1837-1841 & 1842-1859. It was commissioned by his widow as a library and remained in that role until 1958. After a period of decay, in which it was saved from demolition by the Friends of Lewes, it was converted into a private house. This A.M. Bliss postcard featuring the Fitzroy Library carries a 1918 postmark. By 1937 the Minister of Transport Mr Hore-Belisha (he of the beacon) was concerned about the increasing problem of cars being parked in streets, according to a local newspaper report of a speech he gave at a London dinner. As a Conservative minister he naturally hoped that the solution would be provided by private enterprise offering cheap accommodation for stationary cars. Messrs Ruggs Ltd of the Station Garage, Lewes, leapt into action, announcing in the local press that as soon as the present extension to their Station Street premises was completed they would be able to accommodate under one roof as many cars as would stretch from County Hall [now the Law Courts] to Shelleys Hotel if parked bumper to bumper along the High Street. They also hoped to reduce the charge for parking to 3d per hour, with a maximum charge of one shilling for all day. The newspaper commented: “This seems a very practical solution to the situation as far as the County Town is concerned, and even the threatened total ban on street parking need not cause the local authority great concern”. Meanwhile Ruggs Ltd were adding to the local problem by advertising both new and used cars for sale. A 1937 Rover Ten, in maroon and black, was offered at £248, ex-works, while a new Morris Eight-de-luxe was available in blue and black for only £132 10s 0d. Used cars included a 1935 Rover 14 h.p. sports saloon for £165, a 1935 Austin Seven Ruby saloon for £75, a 1934 Vauxhall Light Twelve Six for £75, a 1928 Riley 9 h.p. tourer for £27 10s 0d and a 1930 Austin 16 tourer for £17 10s 0d. A 1930 Singer 5 cwt-van, with good tyres and safety glass, could be had for £12 10s 0d. There were, of course, no MoT tests in those days, and despite the few cars on the road in 1937 there were more than three times as many road accident fatalities as we have today. Sulis Fine Art (www.sulisfineart.com) offered this page of pencil drawings from an old sketchbook, dated August 1912, for sale in June 2016. The sketch to the left is labelled ‘Lewes Castle’, but the perhaps more interesting unattributed sketch to the right appears to show the Swan Inn, Southover. The commemorative plate shown above celebrating Queen Victoria’s Golden Jubilee of 1887 and the mayoralty of Alderman Joseph Farncombe was also offered for sale on ebay in June 2016 by Lewes resident Tony Duc. The plate carries the mark of J Buckman, China Warehouse, Lewes. Both images reproduced with permission from the sellers. This entry was posted in Art & Architectural History, Historical Geography, Lewes, Local History, Political History, Transport History. Bookmark the permalink.